Neostrata was developed by the dermatologists that created the first glycolic peel and who discovered the rejuvenating powers of alpha hydroxy acids (AHA) and polyhydroxy acids (PHA). This was one of the first products to be coined a ‘cosmeceutical’. This advanced skin care range is clinically proven to visibly resurface, restore and refine the skin with products formulated to address specific skin needs. 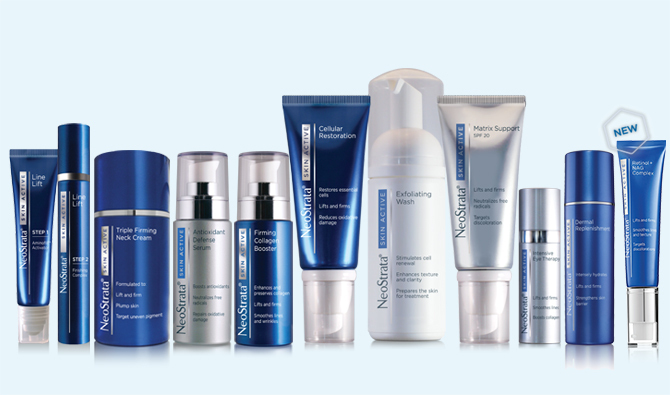 Independent clinical studies have demonstrated the benefits of NeoStrata in reversing visible signs of ageing. Sun exposure is the major cause of skin ageing. It is therefore vital to protect your skin from the sun by using a quality sun protection product on a daily basis. In addition to ultraviolet A (UVA) and ultraviolet B (UVB) radiation, studies have shown that Infrared Radiation (IR-A) and High Energy visible light (HEV) also cause skin damage. Complete photo-protection is therefore absolutely essential, protecting the skin against all forms of sun radiation and thereby minimizing the likelihood of sunburn, sun spots, photo-ageing and skin cancer. 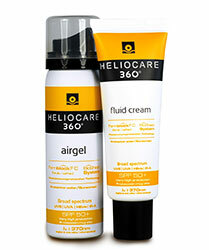 Heliocare provides an advanced range photo-protection with intense antioxidant benefit. The presence of roxisomes also helps repair damage to cellular and mitochondrial DNA. All products in the range are ultra-smooth, oil free and easy-to-apply. When used with Heliocare Ultra Oral Capsules, the Heliocare range truly provides comprehensive protection inside and out. These products have a NAPPI code, which means that the medical aid may reimburse the costs to the member, depending on the scheme and the level of cover. Taking into consideration the signs of premature and normal ageing, Lamelle Research Laboratories set out to create the most powerful age correcting skin care range on the market. The Dermaheal Range has been crafted using concentrations of Nobel Prize winning Growth Factors and offers the ultimate in anti-ageing and laser-free skin remodelling. As we age, our cell turnover becomes sluggish and new cell production decreases by over 50%. A complete treatment offering of oral and topical acne therapy. Up to an 88% improvement in inflammatory acne in 8 weeks. Patented Retinoid therapy. The only topical acne cosmetic product with a retinoid acid ester for improved outcomes. Inhibits 8 steps of the pigmentation pathway. Maximum efficacy across the entire pigment pathway. Patented pigment blocking peptides are combined with conventional skin brightening ingredients. The most advanced pigmentation home programme. The concept of Wellness, Strength, Vitality and Beauty from within is rapidly gaining popularity in South Africa. Collagen Pro-Active, with its unique, scientiﬁcally proven formulation, systemic stimulation of our body’s Collagen. Collagen is a vital protein present and used in most processes within the human body and is hence, the key component of the body’s connective tissue, composing 30% of the total body proteins and 75% of the protein within our skin. As we age and other physiological changes occur within us, the production of Collagen in general, decreases substantially, resulting in the obvious external changes in our skin’s appearance as well as those we can’t see: bone, joint and cartilage degeneration, markedly slower recovery after surgery or exercise induced or accidental injuries. Sufﬁcient quantities of Collagen, in an absorbable form - in order to maintain or increase Collagen production in the body - cannot be provided through the consumption of any foods. Hence the very real need for the daily supplementation of Collagen ProActive. Clinical studies of Collagen Pro-Active have shown that the percentage bioavailability is more than 90%. Thus, supplying the body with high effective doses of Collagen. Collagen Pro-Active is a unique dietary supplement of a premium Hydrolyzed Collagen, rich in speciﬁc amino acids that are easily absorbed by the human body. It contains Hydrolyzed Collagen (Type II) of high quality, enhanced with Vitamins B1, B2, B5, B6 & Magnesium. It is available in 2 delicious ﬂavors of Strawberry & Lemon. It is fat-free and completely safe without side effects. (1) Dr. E. Meucci, M. C. Mele, Amino acids and plasma antioxidant capacity, 1997, Volume 12, Issue 3-4, pp 373-377. (2) Arquel-Porcell, P. Pujol-Amat, 1996, Study on the action of a nutritional supplement that focuses on joint pain produced by osteoarthritis or joint aging in a population who regularly per- forms low-intensity exercise. (3) J. Ll. Ribas, O. Molinero, 1998, Study on the effect of a nutritional supplement with gelatin hydrolysates that focuses on the prevention of sport injury.